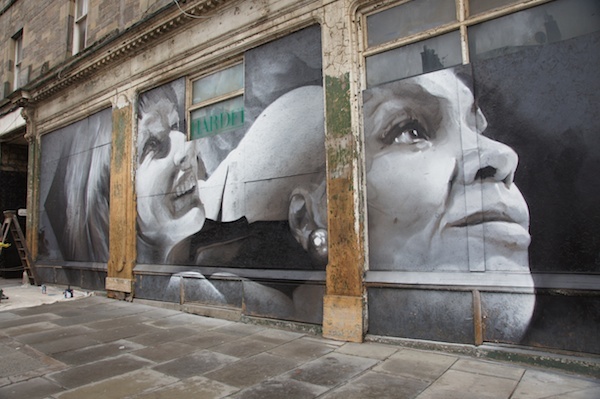 LeithLate is showcasing the work of international street artist Guido van Helten on two Leith sites: the former Rubber Mill at 234 Leith Walk and at Out of the Blue Drill Hall on Dalmeny Street. Guido paints large-scale photo realist portraiture with spray cans freehand, using subjects that are relevant to the mural site or place. 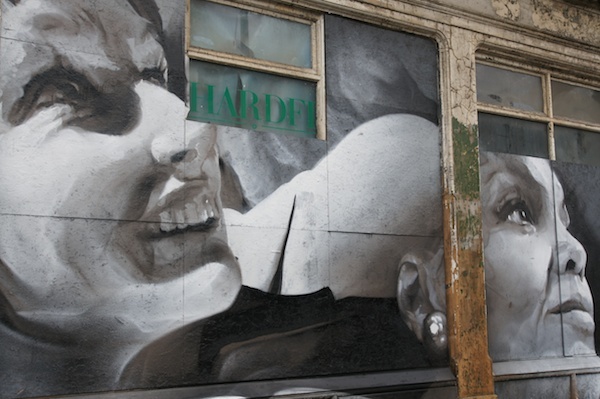 Guido’s work always references the mural site or area. In Out of the Blue’s case, the building has a strong connection to the Gretna rail disaster (the worst in the UK to date) of 1915 which killed 227 people and injured 246 others. 102 of those killed were young men from the 7th (Leith) Battalion of the Royal Scots, on their way to Liverpool, where they were to leave for Gallipoli. The bodies of the victims were laid out in the Drill Hall prior to burial in Rosebank Cemetery. Instead of focusing on the tragedy of the story, Guido painted a portrait of one of the survivors of the disaster, in his old age. For the Leith Walk piece, Guido is painting a scene from an Edinburgh International Festival production of Macmillan’s version of Seven Deadly Sins, performed at Festival and King’s Theatres, Edinburgh in 1961. The heroine of the production is a split personality: rational vs impulsive/creative – which could be interpreted as a reference to the relationship between Edinburgh and Leith! The 1961 production chose to portray the relationship as that of two sisters, played by ballerina Anja Linden and singer Cleo Laine, both of which will be represented in the final artwork. 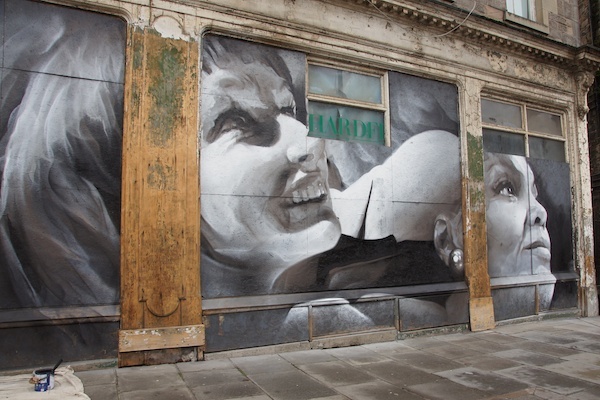 The Edinburgh Reporter met him on Leith Walk when he was just ready to add his signature to the mural…. For examples of his work to date, see Guido’s own website. Next articleNational Performance Centre for Sport is coming to Edinburgh!